From the end of April until the beginning of May, Japan welcomes a keenly awaited holiday season, so precious it’s called “Golden Week”. This Week consists of Showa Day (the beginning of previous Emperor’s reign), Constitution Memorial Day (the declaration of Japan’s 1947 Constitution, made after its defeat in the World War 2), Greenery Day (a day to appreciate of nature), and Children’s Day (this is when you see the fish flags). Taking advantage of these four holidays plus a couple more days off, this is the time for Japanese people and residents to easily take long-ish vacations. This year, I’m one of them: off to Vietnam! With two friends from Jakarta, I started with Hanoi, the capital city with a sense of ease. The most popular area in Hanoi is around Hoàn Kiem Lake and the Old Quarter. We stayed at an AirBNB around 10 minutes walk from the lake, a cosy place with lots of space and everything we needed (it was a five-out-of-five property – contact me if you need info on this AirBNB. ;)) On our way from apartment to the Lake, we could find many shops in identical shape with narrow doors and many floors. I was amused to see a Salvatore Ferragamo shop designed in the same way as the local knock-off shop (more amused by the fact we could find a Ferragamo shop in this communist country). Almost all the time we were there, the main streets around Old Quarter area were blocked from cars so we could enjoy walking around the lake and open market together with residents. Hanoi is not a quiet city; I’ve seen traffic jams in other areas a bit further from Old Quarter, but it was still relaxing. The city has the right population density, I guess. A trip to Vietnam means a trip to the past. Before going, I read a novel about the Vietnam War (“The Sympathizer“) to get a bit more educated about the history of the nation. I understood the different perspectives on the War and what kind of characters I could meet in the country. During our trip, we visited the War, post-War, and the modern-day Vietnam. We started the journey by going to Maison Centrale in Hanoi, a prison used to detain people during the War time. First it kept Vietnamese criminals detained by the French, then detain captured American soldiers during the Vietnam War. The place was horrid. Prisoners were bound with iron bars at their feet, their arms sticking to each other, fed small lumps of decaying fish and broken rice with limited amount of water. There was a guillotine, the device used for beheading, and the photographs of heads being put on display during those days. I got goosebumps from looking at the containment cell. The prison also showed the time when American soldiers lived there as prisoners, which looked much less grotesque, much less significant, and much shorter. I didn’t realize it at first, but I think we could see so little because the current government doesn’t want to show what happened there during the time. 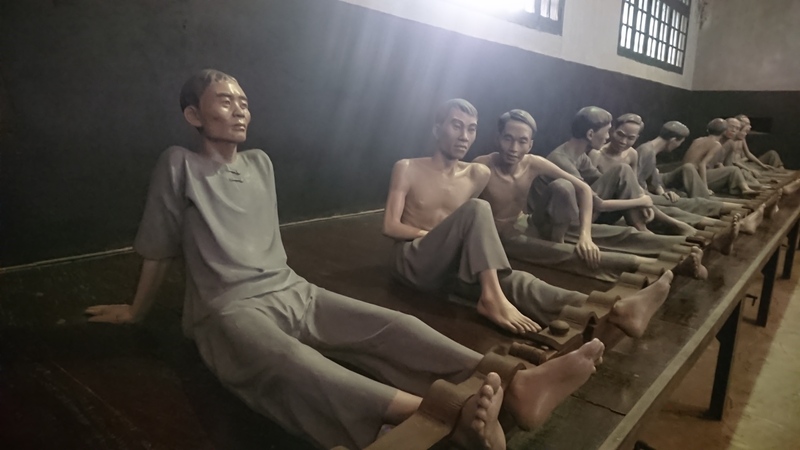 Models of prisoners in Maison Centrale or “Hanoi Hilton”. Prisoners were bound at their feet. For a bit of culture, I went to the Temple of Literature, built for Confucius and used to be a university of Vietnam’s top scholars. We also watched the traditional water puppet show, which looked simple but actually pretty impressive. The show played snapshots of Vietnamese traditional way of life (working at the rice paddy fields and paying respect to the ancestors) as well as Vietnamese mythology including the creatures that embody its values (dragon, phoenix, tortoise, and unicorn). The show was short and in my opinion worth a visit (it was only VND 100,000 = USD 5). There’s little narration only in Vietnamese but you can enjoy without understanding the language – nothing to worry about. We met three more travelers, French friends from around the world, in Ho Chi Minh City and continued our trail to the past through the War Remnants Museum. This museum taught us so much more about the appalling Vietnam/American War that lasted 25 years. It’s somewhere between a civil war and occupation war, since the purpose was to “liberate” Vietnam especially the Southern part from communism with the aid from the United States. At the time (the 1960’s-70’s) communism was spreading throughout the world particularly in the Soviet Union and the U.S., as the opposing capitalist power, did everything it could to to spread further influence of communism in the Asian region. After the War, the U.S. admitted that they committed war crimes, including blood-thirsty manslaughter. They admitted that their soldiers would pick any civilian and kill them on the spot, then claim them as Viet Congs. I cannot forget this picture of a scared farmer during this kind of search operation.. Furthermore, the American military used “Agent Orange”, or the dioxin, to kill trees in the dense forests so that Vietnamese resistance fighters couldn’t hide among them. Dioxin is a highly toxic chemical. People who are exposed to this chemical can suffer damage on their cells, leading to organ damages, cancer, and genetically pass the damage to their children and their children’s children. In the Museum, we could see many pictures of the victims who were born or grew up in physical deformations like enlarged head and diminishing legs. I saw a picture of Viet and Duc, the famous conjoined Vietnamese twins, who were the symbol for the social movement against Agent Orange in the past. Until this day, there still are victims to this horrendous use of chemicals in wartime. Not only Vietnamese but also Americans. Similarly, victims are still falling from uncleaned land mines left throughout the country. 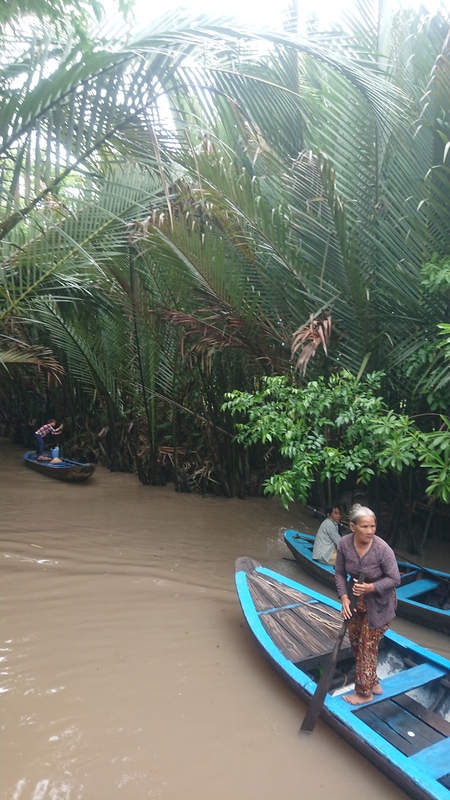 We also went for a full-day trip to the Chu Chi Tunnels and the Mekong Delta. Chu Chi Tunnels used to be the underground structure through which Vietnamese fighters move around Sai Gon and all the way to Cambodia. Three-levels under became the home and base camp of hundreds of fighters who fought both the French and American army. At this site we could try crawling in the tunnels, learn the intelligibility of various ground traps made of bamboo (most will stab you on the feet), and have a go with AK-47. Mekong Delta trip took us to three islands where we could see local factories making coconut candies and take the iconic boat ride. We regretted that due to limited time our boat ride was very short and we couldn’t go to the floating market. I went to Sai Gon with no expectations or rather hoping it would be similar to Hanoi, just bigger. It turned out to be a metropolis with a very similar feel to Jakarta, although we were never stuck in traffic and you haven’t been to Jakarta if you didn’t get stuck in traffic. We mostly walked, which was great most of the time, until we turn a corner that led to a busy road. Roads around the city are full of motorcycles and irrelevant traffic lights. No Sai Gon driver would spare 3 seconds to hit the brake and slow down to allow pedestrians cross. It was all too familiar, and I was secretly hoping none of us would have to claim our travel insurance for being struck by a motorcycle. Despite the stress, the city trip to old buildings was pretty nice. We went to the Ho Chi Minh City Central Post Office: a beautiful, highly maintained vintage building equipped with old-phone-booths-turn-ATM and letter-writing desks. It could have offered more nostalgic atmosphere but I was impressed by how well the building condition was. Next to the Post Office lined small bookshops where you can browse Vietnamese publications, buy tote bags and good quality knickknacks. There are benches where you can sit down, enjoy the breeze, have coffee, and do a photo shoot like some people do (e.g. us :p). Sai Gon is the place for urban life, live music, dinner at bistros, city lights, and shopping malls. Lastly, I felt Sai Gon was more expensive than Hanoi, especially for souvenirs. Sai Gon or Ho Chi Minh City? Maybe this question popped in your mind since I use the two names interchangeably. That was exactly my question: what is the appropriate way to call the city, Sai Gon or Ho Chi Minh City? I didn’t want to offend anyone by being misinformed but at the same time didn’t want to be deceived. 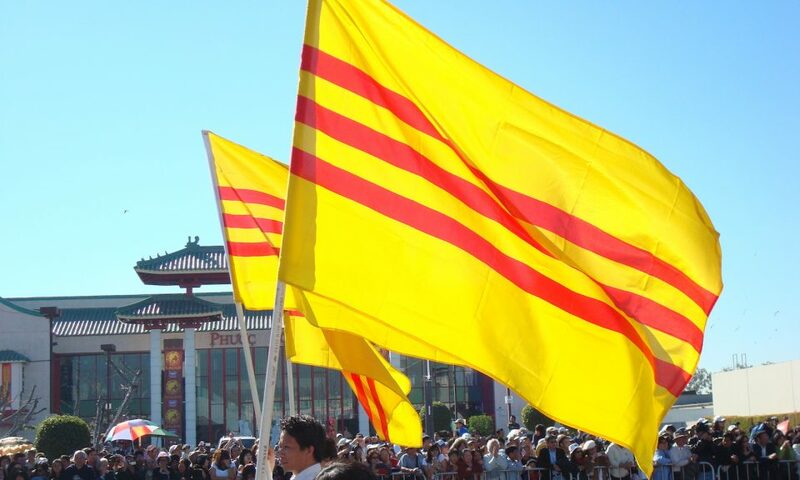 The book I read explained the history of the city and the other flag it used to carry (Northern Vietnam and Southern Vietnam used to carry different ones), but didn’t mention about the current use of name. I knew that Sai Gon was the old name used before the end of Vietnam/American War and the liberation/fall of Sai Gon (the use of these names depends on which side of the War you want to look at it from). After the War the name was changed to Ho Chi Minh City to respect the leader of the liberation and the Founding Father of the Vietnam as we know it today. This name has continued to be the official name. But I didn’t understand why the name Sai Gon remained and which name is to be used. As it turned out, from various other readings, the answer is when you are in the country you can use either name without hurting anyone’s feeling. The residents of Ho Chi Minh City still call their city Sai Gon out of habit, so it’s not a problem to use either name. But if you ever go somewhere and have a chance to talk with Vietnamese refugees or its next generation who fled at the end of the War and now live in the United States, France, Australia, Japan, and many other places in the world, they might prefer to call the city Sai Gon. The country’s history remains to be complicated but the way people are living is still as how the detained American soldier wrote it in his letter home: simple, hardworking, and just want to keep the peace. Ho Chi Minh led the country throughout the War against Japan, France, and the U.S. The Father of communist Vietnam, he continues to be the most important figure in the country. 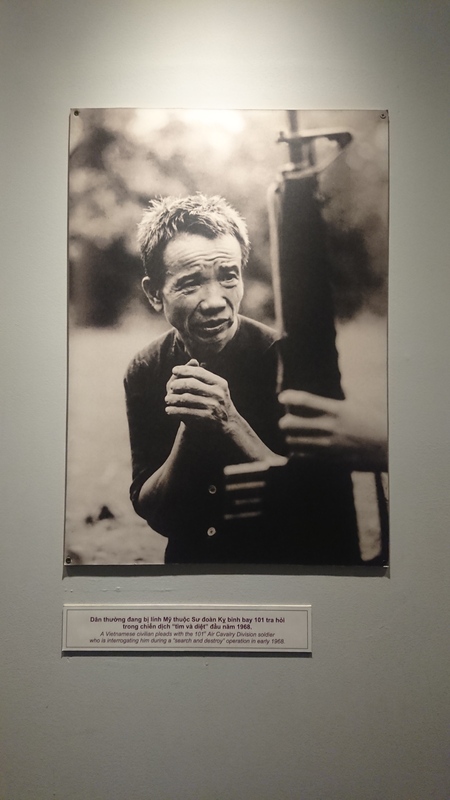 His picture and quotes are still found everywhere in Hanoi and Ho Chi Minh City. After his death, his body was embalmed and to this day could be seen in the Mausoleum in Hanoi. This is one of the few embalmed bodies of leaders that you could see in the world including Lenin’s body in Moscow, Kim Jong-Il in Pyongyang, and Mao Zedong in Beijing. If you visit Hanoi it would be interesting to spare some time to queue for seeing the body, we couldn’t because the line was much too long since we were there at the most crowded time: a day after 30 April’s Reunification Day holiday. Food is simple, cheap, and healthy in Vietnam. Most of the dish are boiled, steamed, or served raw. We ate rice noodles for almost every meal in Hanoi and Sai Gon: pho, bun, repeat. And of course spring rolls! I felt like we ate so much, yet maybe they were light, because I apparently became used to eating little for I became instantly full on my first proper lunch back in Japan. I always feel food represents the way of living and values the people hold. I feel Vietnamese way of living is simple and determined. Remnants of the long war continues to influence the current Vietnam, and the food culture continues from using easily collected, naturally sourced, quickly prepared dishes to fuel the resistance. There’s a must-try place that I want to recommend in Hanoi: Ưu Đàm Chay, a vegan restaurant. It has excellent food, but be warned, bad service. The spring rolls and brown rice were absolutely delightful for the taste buds, drinks were fresh and satisfying, desserts were colorful and fun. Why did I mention bad service? Because we went for the green curry but it never arrived without any explanation. It’s unfortunate because otherwise it would’ve been our perfect lunch experience. Another food tip is that the best pho we had in Vietnam was at a very simple “local” shop near the Lake. From our experience you don’t need to find “a hidden gem” or on the contrary go to a “proper/popular restaurant” for the delicious and rich soup. Try to find a shop where you could imagine office workers go for their lunch or their dinner before going home. In one of these places, we found the best beef pho we had in Vietnam. When bored with rice noodles, try the banh mi baguette sandwiches. Similar to the variety of rice noodle dishes, you can find a number of coffee variations. I’m still surprised at how a colleague of mine didn’t know the immense popularity of Vietnamese coffee, when according to Bloomberg the country is the world’s biggest robusta producer and “Vietnamese coffee” itself is a brand-name. I was well aware of this reputation and was super ready to practice my milky-coffee-in-the-morning-black-after meal ritual. So that’s what I did: coffee, coffee, coffee! All the coffee I had didn’t do any less than give me that blissful seconds of caffeine high. I don’t have particular recommendations for coffee place for the taste since all of them were good. 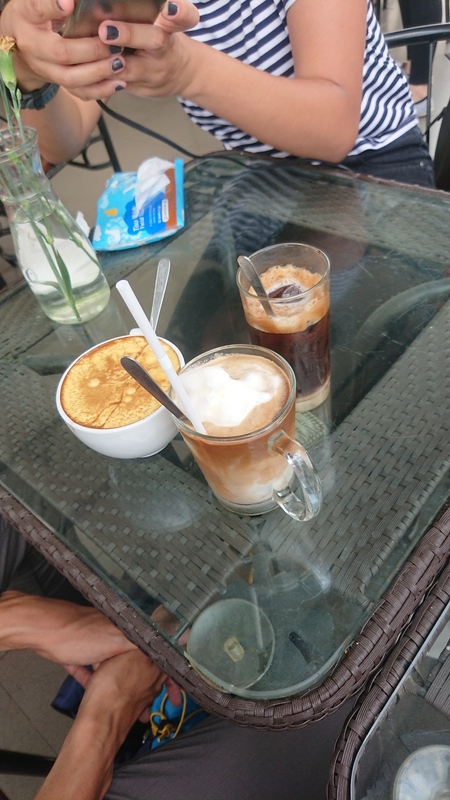 There are coffee shops everywhere you turn, just pick one and choose the cà phê sữa đá (hot coffee) or cà phê sữa nóng (cold coffee). Both of them are “Vietnamese coffee” which comes with condensed milk, so they are sweet and could be too sweet sometimes. We also tried “egg coffee” and “coconut coffee”. The former, which comes hot and not so sweet, is thick and quite fulfilling. You won’t get a bad egg taste from a good cup. The latter comes cold and sweet, I think is also a must-try in Vietnam. Hanoi offered so many places to see and things to do. So let me convince you that a trip to Hanoi won’t be complete without a cruise at Ha Long Bay. 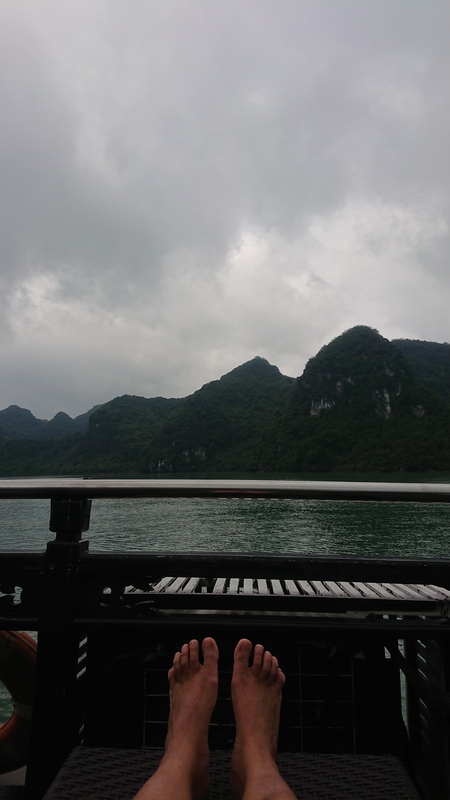 We had a relaxing trip to Lan Ha Bay (close to the crowded Ha Long) with a tour organizer. There are hundreds of tour organizer in the city, so it’s hard to pick out one with a kind of assurance that the boat won’t have holes on the deck or your belly won’t be satisfied. There are different ranges of price, too. I recommend taking a one-night cruise at mid-range price which was worth it (also email me if you want to know the operator I chose). Another highlight in this tour was getting to know other travelers, especially a family of five whose small daughter took everyone’s heart away and lit up every corner. The Dutch family has been traveling every year since the first son was a baby (now 10 years old). When we asked them about these trips, the mom said that she and her husband wanted to “give the children lessons on family bond, navigating different places, and surviving in various conditions”. The children have now grown to be decent, active, and curious about the world. 🙂 For me they are the embodiment of #familygoals. The sun didn’t come out too often while in Ha Long Bay, but we were happy with the overcast and cool temperature. It wrapped us in a sleepy atmosphere and repeatedly brought us blissful moments of falling asleep! I enjoyed the whole holiday and felt very refreshed during the trip and after coming back. Trip with a group of friends this time was a lot of fun with many chats and jokes thrown around. I also felt enriched by the lessons in history, distorted reality, and the need for humanity. I might write another post about the war. If I would’ve done anything differently, I’d probably reduce time at Ho Chi Minh City and add more time to accommodate a trip to Mekong Delta including the floating market. Or just pass by Ho Chi Minh City and visit Da Nang+Hoi An or Nha Trang instead. Everyone I spoke with recommended Da Nang which has the most beautiful beach resorts. Staying in Da Nang will allow you to visit Hoi An, the previous capital city which now is a tranquil historical city. Nha Trang is the place to do absolutely nothing, which should be part of a proper holiday. Guess I should visit again!